It makes me happy to compose good music for amazing images. It fuels my imagination and sets me in motion. Motion is a source of my inspiration. The best ideas often emerge when I am on my bike or out running, or at the piano, directly experiencing the instrument’s resonance. My background is playing instruments and this is what composing primarily is. Computers, sounds, libraries and effects come second. I am inspired by everything I see and experience, be it a painting by Caravaggio, a film by Almodóvar or a partita by Bach. Bach, in particular, is a strong source of inspiration, his works being both logical and emotional which arouse fundamental feelings. Music should move people, either directly or in a subtle manner. And music should deliberately make use of pauses, because composing is also a decision about when to delay or even omit parts of the score to create an even stronger effect. Music without pauses is a misconception. It all boils down to timing and rhythm and thus to motion. Oliver Heuss works as a freelance composer and producer. He was born in Sao Paulo (Brazil) in 1961 and has lived in Hamburg since 2007 with a short stay in Cologne. He studied at the Berklee College of Music in Boston (USA), at Amilton Godoy's Jazz School in Sao Paulo, and with Walter Norris in Berlin. He also attended the Cologne Music Academy with Rainer Brüninghaus from which he graduated with distinction. As songwriter and keyboardist of the band "Trio Rio", he gained international chart success in 1986 with "New York-Rio-Tokyo". He has worked with jazz musicians such as Toots Thielemans, and artists such as Randy Crawford and Jack Radics. Today, his work focuses on music for films and television. Music and sound design (5.1 DTS) for the feature films for the Motion Ride in the SIMEX simulators Autostadt AG / Wolfsburg. Production: Daywalker Studios. "Ein Fall für die Anrheiner” TV series. (Ziegler Film / WDR). Relaunch of the popular 2001 WDR series in thriller format. "Mythos Amazonas". Directed by Christian Baumeister. (ARD / ARTE). 3-part series from the ARD format "Erlebnis Erde”. "Wildes Skandinavien". (ARD / ARTE, 2011). 6-part series from the ARD format "Erlebnis Erde"
Feature film "Die Nordsee – Unser Meer". (Studio Hamburg / NDR). 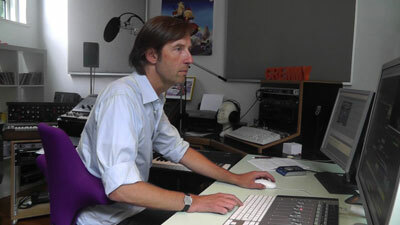 Voice actor Axel Prahl. The feature film "Si-o-se Pol". Director: Henrik Peschel (57 Films). Actor Ramin Yazdani and Pheline Roggan.